CALL US TODAY and let us know what we can do for you and your roofing needs. We provide roof repair and roof installation. "Norman Roofing Co. repaired our roof last summer after a nasty storm. They were out the very next morning and gave an estimate. We were very pleased with their professionalism and quality of work. Highly recommend!" "We were looking for a reliable roof installation company in Norman, OK. Our friends recommended Norman Roofing Co. They were outstanding to put it simply. If you are looking for a roofing company in Norman, OK, look no further." 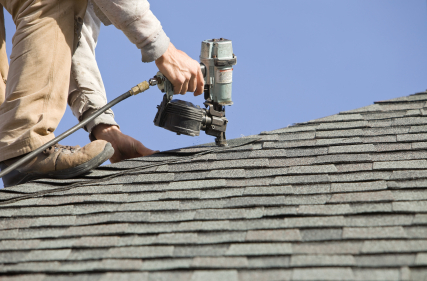 Norman Roofing Co. is the area's leading provider of roofing services. We offer both residential and commercial roofing services. Our number one priority is to provide you with roofing contractors that are professional, reliable, and experts in the field. We offer competitive pricing and customer service that is second to none. Please let us know how we can meet your roofing needs. If you are looking for a reliable roof repair company near you, you can trust that Norman Roofing Co. will handle all of your roofing needs, including emergency roof repair. We don't need to tell you the importance of a quality roof in this area of our great country. A roof is the main defender from everything that mother nature can throw at us and not all roofs are created equal. In the Norman, Oklahoma area, we see a little bit of it all. From thunderstorms, to snow, to treacherous winds, the importance of a quality built roof cannot be over emphasized. Not only can a well built roof protect you and your family from the elements, it can save you boatloads of money. A quality roof prevents things from entering your home, but also keeps things inside. Your A/C works very hard to keep you cool in the summer, and our roofs ensure that none of that glorious cool air leaves your home. And vice versa, that warm air coming from your furnace in the winter will have no where to escape, keeping you and your loved ones warm and toasty all winter long. Not to mention the money you will save with reduced heating and cooling bills. Norman Roofing Co. provides both residential and commercial roofing services in the Norman, Oklahoma area. We also serve all surrounding areas including Oklahoma City. There is no job (..or roof) to big for us to handle. We are expert roofers. At Norman Roofing Co. we offer a full line of roofing services that include roof installation, roof repair, and roof replacement. We provide both residential and commercial services and our roofers are the best in the area. INSTALLATION Our team of experts have been in the roof installation service for a long time. We use the latest technological advances and materials of only the highest quality. 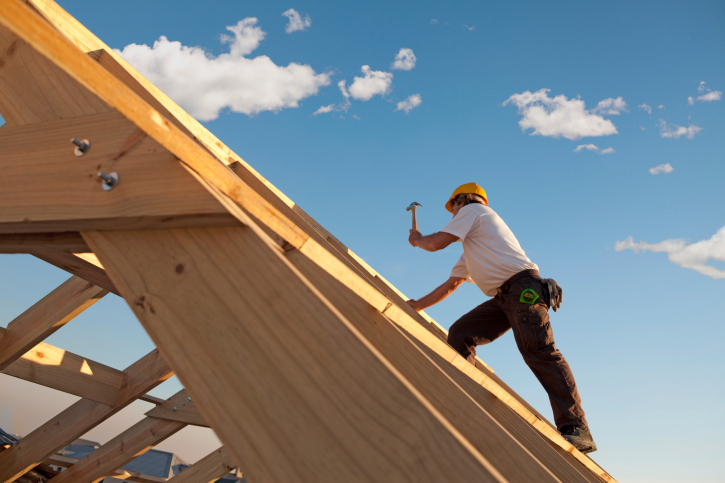 The roof installation process is a very detailed process and we take zero shortcuts. We evaluate each roofing job to determine exactly what type of roof is required to meet the demands of the existing structure. We are in constant communication with our customers to determine what they want their roof to look like. We also discuss with customers exactly what types of roofing materials will be used to construct the best possible roof for each and every job. Customer satisfaction is our number one priority. REPAIR Our technicians are also there for you to make repairs to your existing roof. A small amount of damage to your existing roof can quickly become a much larger problem. Call us immediately to receive a free estimate and consultation. We can generally have someone at your home or business to evaluate the damage or problem within an hour or two. Once the problem is determined, one of our technicians will walk you through the repair process and give an honest, no hassle estimate of what it will take to make the needed repairs. 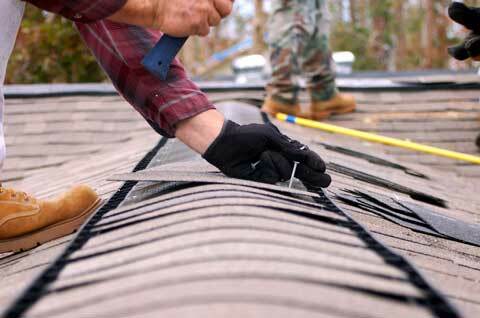 Then we will promptly begin the work and get your roof back to tip top shape. We are capable of providing emergency roof repair. Our track record of excellent customer testimonials is living proof that Norman Roofing Co. is an honest and reliable company when it comes to roof repair Our customers are our greatest asset. Top Ten Reasons to Use Norman Roof Co.
1. At Norman Roofing Co. our customer service is our greatest asset. We pride ourselves on treating our customers like they were members of our own family...well...the ones we like anyway. We work hand and hand with you through every step of the process and are happy to answer any questions or deal with any concerns you may have. Our customer service will not be beat in the Norman, Oklahoma area. 3. Our technicians are certified and have a lot of experience. You can trust Norman Roofing Co. and our employees to provide top notch service and treat you and your home or office building with the respect you deserve. Also, we run all of our employees through a very extensive background check to assure you that you have nothing to worry about. You can trust us to be the "go-to" roofer in Norman, OK.
​4. Company is locally operated and owned. We have been serving the Norman, Oklahoma area and all surrounding areas for over 15 years. 5. Top Quality Materials: Norman Roofing Co. experts only use top of the line materials GAF, Owens Corning, Tamco, Duro-Last, etc. 6. Our roofing services are affordable. We understand that everyone has a different budget. At Norman Roofing Co. we will work with the customer to find an affordable solution. We will not hang you out to dry and we guarantee a top notch product. 7. When the big storm hits and you need roofing help NOW we provide licensed and public adjusters to guide you through every step of the claims process. We will make the process as painless as possible. ​9. Reliable Service. At Norman Roofing Co. it is our priority to provide you with excellent customer service. We feel that the actual work (roof repairs, installation) is only the first part of our job. We stick by our customers and want to help you with every step of the process...from insurance claims to selecting the right materials for your roof. You are our number one priority! 10. Competitive Pricing. We may not be the cheapest roofing contractor in the area, but we guarantee that you will be happy with the level of service and excellence that you receive for what you pay.